At Keeneland Monday, Hip 147, My Miss Sophia (Unbridled’s Song–Wildwood Flower, by Langfuhr) drew a $4 million final bid from agent Steve Young, who also previously signed the ticket on her half brother, GI Florida Derby winner Materiality (Afleet Alex). Trainer Todd Pletcher signed for the $260,000 KEESEP yearling in 2012 and she went on to win at the Grade II level for the trainer, in addition to finishing runner up in the GI Kentucky Oaks. 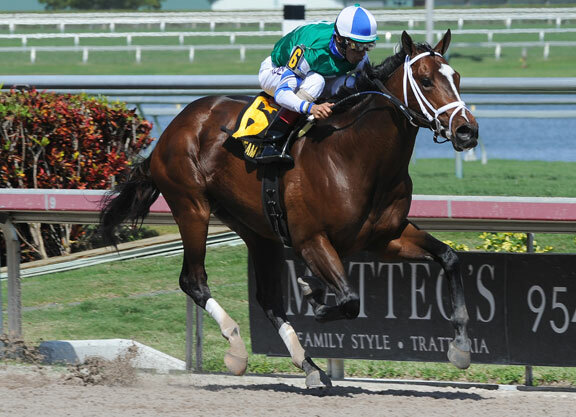 She subsequently sold to Reynolds Bell Jr. for $2.15 million at Fasig Tipton November in 2014. The John Gunther bred is in foal to War Front.